Click on the Star Wars image for full (pixel) size. 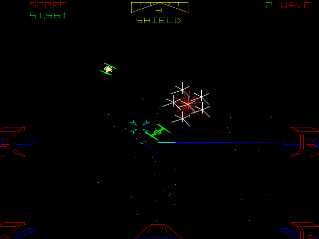 3D Starfighter is already at full pixel size. However, Star Wars also has other bits, such as going through the tunnels and blowing up the Death Star (at the end of each level) plus some tower-shooty bits. 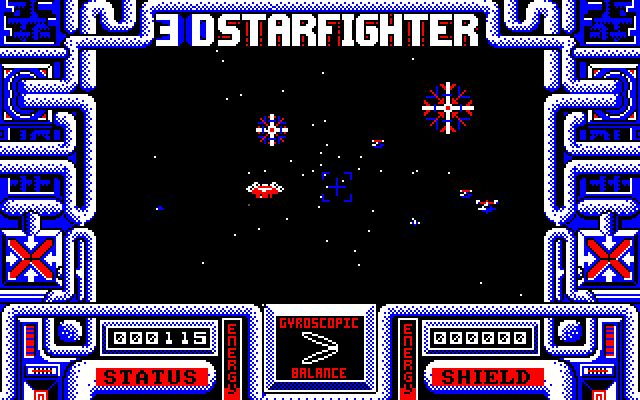 3D Starfighter has none of these. Mind you, it was only £2.99 so I don't suppose there's much room for complaint. Anyway, why wasn't it called "Advanced Star Fight Simulator", which would have fitted in with all the other "advanced" and "professional" "simulators" that Codemasters churned out, that weren't advanced, professional or simulators. You could argue it is impossible to simulate something that doesn't exist, but none of the Codemasters games were simulators, even if they were called them. A top down view of a situation isn't a simulation in my book. The starship simulator would be more accurate, as no-one knows what a starship is supposed to be like, anyway.